Dimitri Krainc, MD, PhD, Aaron Montgomery Ward Professor and chair of Neurology, received the Javits Award for his research on neurodegeneration. 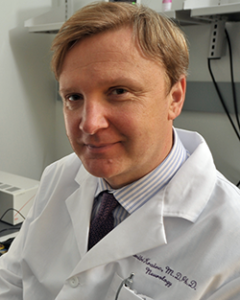 Dimitri Krainc, MD, PhD, Aaron Montgomery Ward Professor and chair of Neurology, has received the Javits Neuroscience Investigator Award from the National Institute of Neurological Disorders and Stroke. The Javits Award is presented to distinguished investigators who have made exceptional achievements in the field of neurological science and are expected to continue to produce cutting-edge research in the coming years. The prestigious award, which provides up to seven years of research funding, will support Krainc’s ongoing work to uncover the pathogenesis of neurodegeneration, with the goal of developing new therapies for Parkinson’s disease and related conditions. Krainc’s lab focuses on genetic diseases in order to better understand how mutations in genes influence the key pathogenic mechanisms involved in neurodegeneration, such as mitochondrial dysfunction and the accumulation and deficient degradation of aggregation-prone proteins. “With the Javits Award, we will be able to gain a deeper understanding of the mechanisms of Parkinson’s disease and set the stage for the development of novel targeted therapies for Parkinson’s and related disorders,” Krainc said. Krainc is also director of the Center for Rare Neurological Diseases. He joined Northwestern in July 2013, after more than two decades at Harvard Medical School. The Javits Award, established by Congress in 1983, is named in honor of the late Senator Jacob Javits of New York, who suffered from amyotrophic lateral sclerosis and was a strong advocate for research on neurological disorders.